The Achromic Series features a bi-amped, high-efficiency fan cooled Class A/B switching power amp for highs and a Class D power amp for low end. Each cabinet is carefully designed with components specifically chosen to provide high SPL levels while ensuring smooth coverage across all frequencies in a lightweight package. Power Ranges from 1000 Watts for the A10 to 1200 Watts for the A12/A15. Designed to work for you, the full-range speakers feature a 35mm pole socket with two position options – zero or a 7.5-degree downward tilt for stand mounting but can also be flown via the built-in M10 fly points. 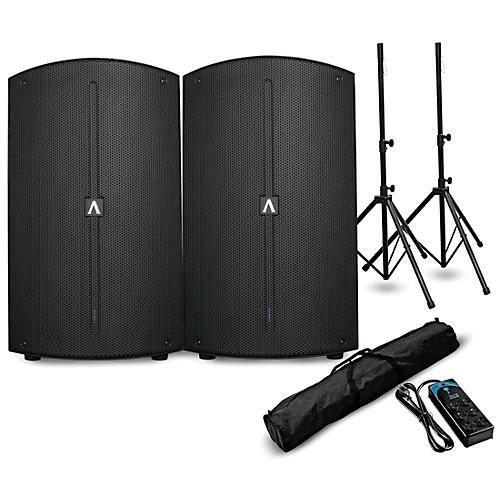 To provide enhanced bass response and extended low-frequency coverage, the Achromic Series also includes two active DSP Controlled sub-options with configurable output directivity. The cardioid output option allows you to better focus your low end in a ground stack configuration for tight clean bass. Every model in the Achromic Series features an advanced easy to use Digital Signal Processor accessible via an LCD screen on the rear panel of the speaker. The built-in DSP allows you custom optimization to configure the speaker specifically for your needs: Music Type /Room/mounting option/EQ/ and System configurations.